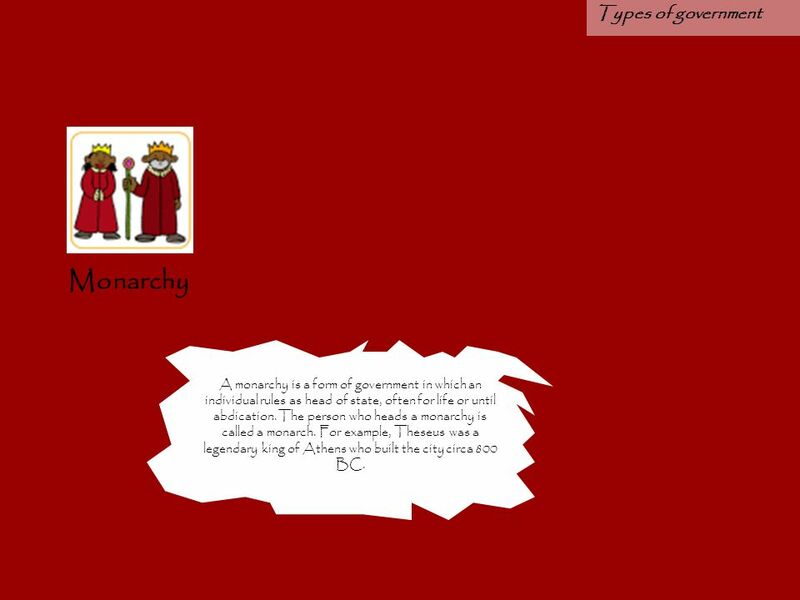 A monarchy is a form of government in which an individual rules as head of state, often for life or until abdication. The person who heads a monarchy is called a monarch. For example, Theseus was a legendary king of Athens who built the city circa 800 BC. 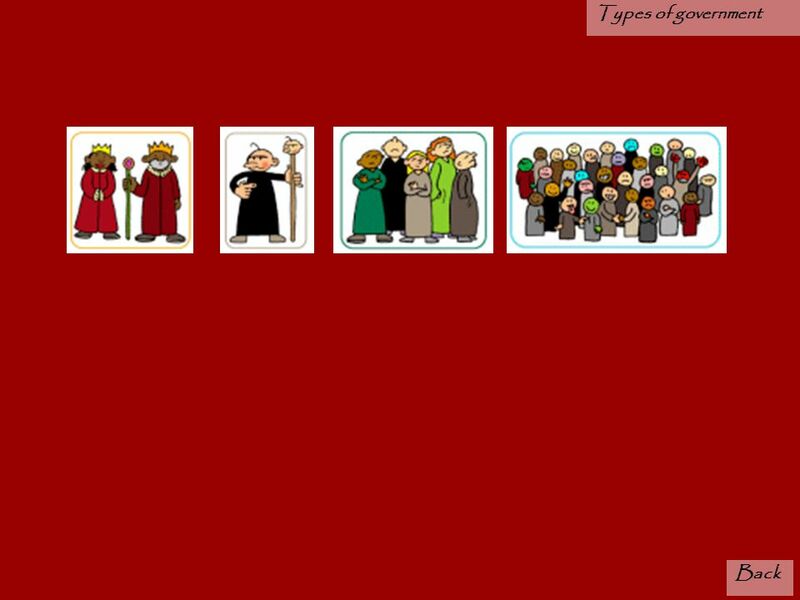 is a single ruler holding vast, if not absolute power through a state or in an organization. The term carries modern connotations of a harsh and cruel ruler who places his or her own interests or the interests of a small oligarchy over the best interests of the general population which the tyrant governs or controls. However, in the classical sense, the word simply means one who has taken (for example Pisistrate who steered in Athens from 561 to 527 BC ) power by their own means as opposed to hereditary or constitutional power (and generally without the modern connotations). 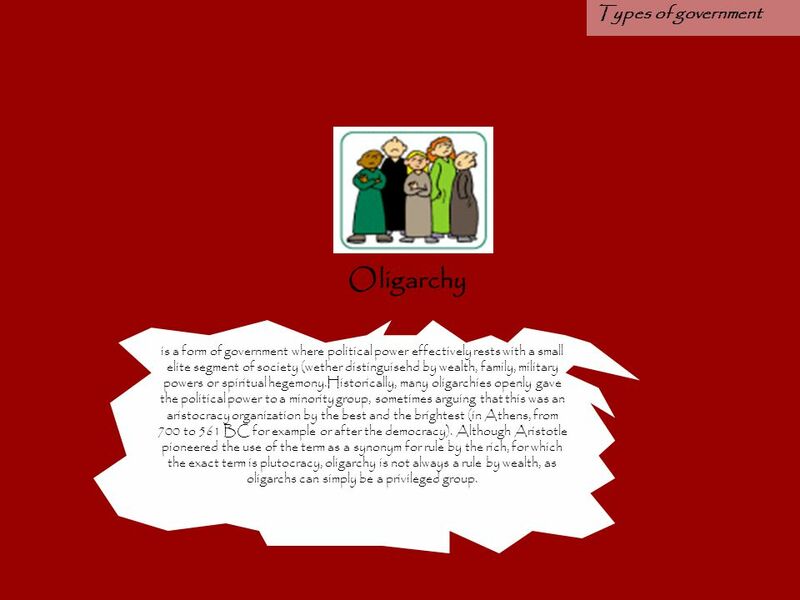 is a form of government where political power effectively rests with a small elite segment of society (wether distinguisehd by wealth, family, military powers or spiritual hegemony.Historically, many oligarchies openly gave the political power to a minority group, sometimes arguing that this was an aristocracy organization by the best and the brightest (in Athens, from 700 to 561 BC for example or after the democracy). Although Aristotle pioneered the use of the term as a synonym for rule by the rich, for which the exact term is plutocracy, oligarchy is not always a rule by wealth, as oligarchs can simply be a privileged group. 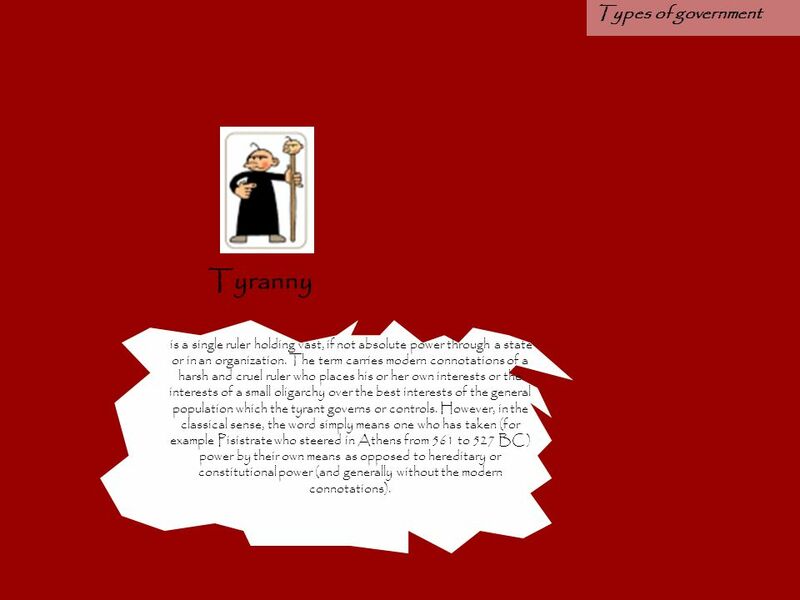 Is a system of govemment by which political sovereignty is retained by the people and exercised directly by citizens. In moderm times it has also been used to refer to a constitutional republic where the people have a voice through their elected representatives. It is derived from the Greek in the midle of the 5th century BC to denote the politcal systems the existing in some Greek city-sates, notably Athens. 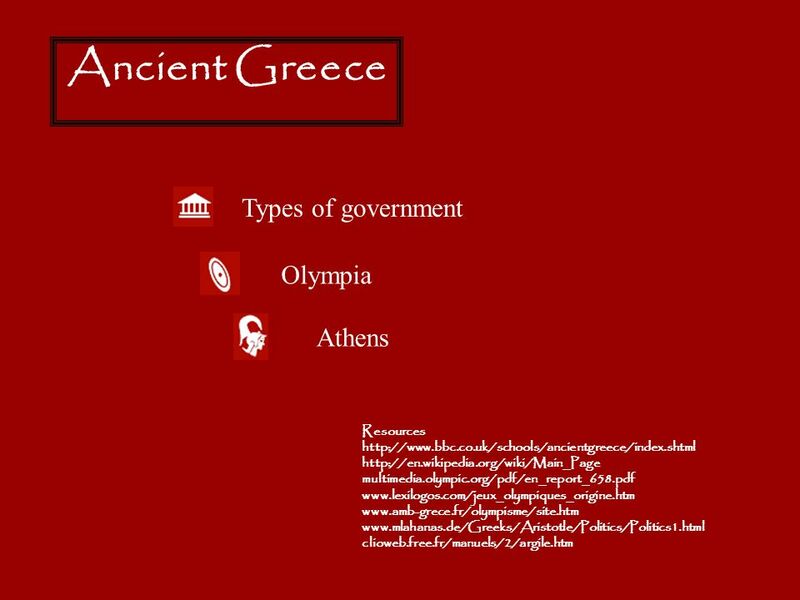 Download ppt "Ancient Greece Types of government Olympia Athens Resources"
The Rise of Democracy SS.6.W.3.2 & SS.6.C.1.1. SPARTA and ATHENS I can compare and contrast the daily lives of people living in the ancient Greek city-states of Sparta and Athens. The Olympic Games By Madi. 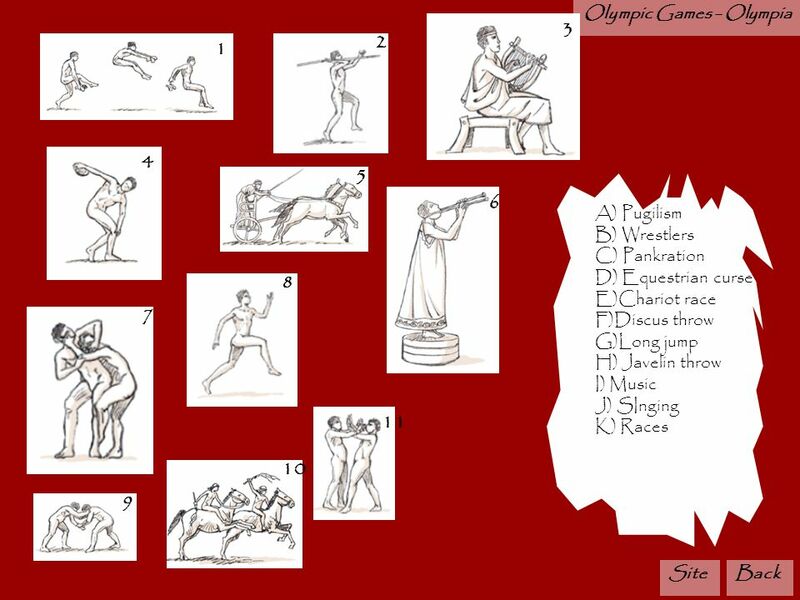 How it all started The Ancient Greek Olympics were a lot different than our Olympics now-a- days. The only people who were. 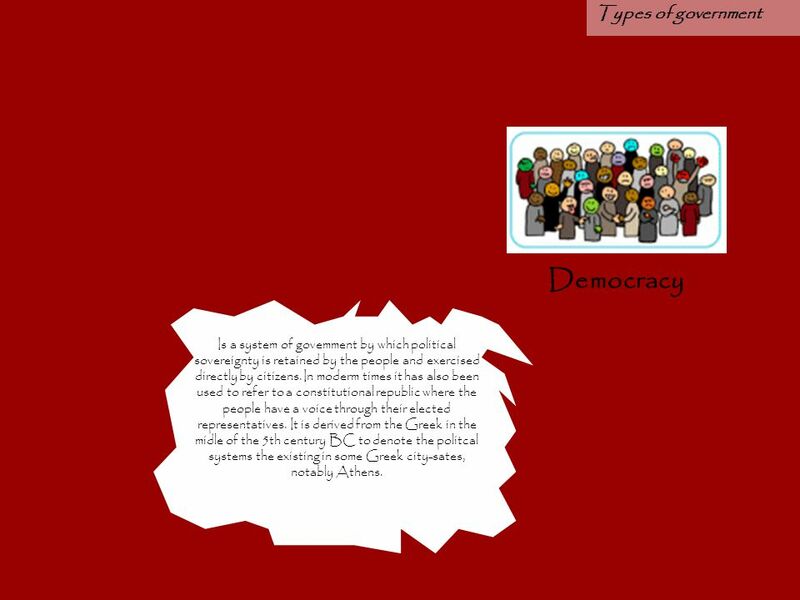 EQ: How did the people of Athens create a democracy? HAIKU HUMP DAY! 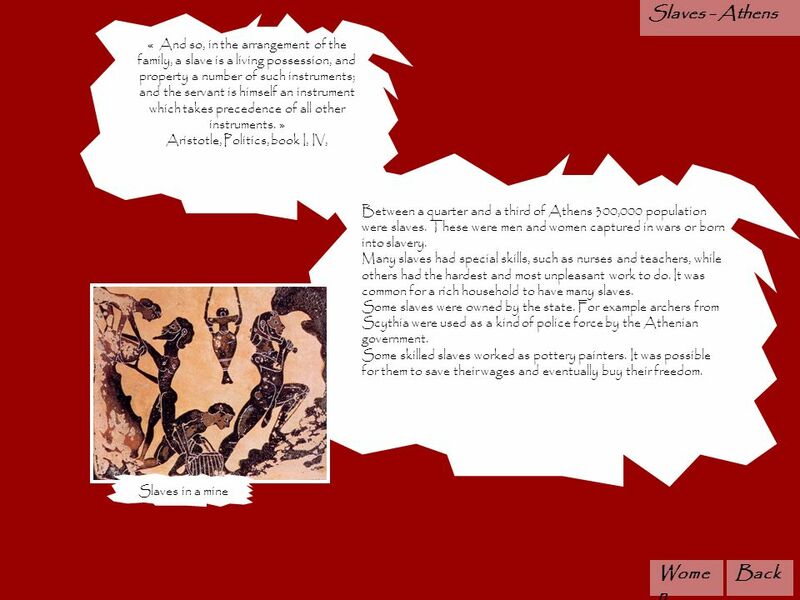 Write a haiku about how geography affected Ancient Greece. 5 syllables 7 syllables 5 syllables DO NOW – THURSDAY, OCTOBER 24 TH. 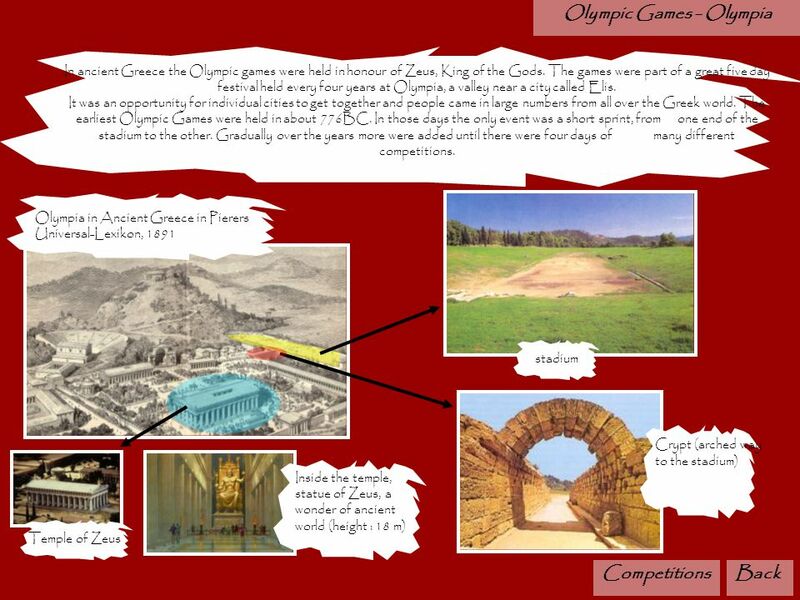 The Olympic games Ancient and modern!. What are Olympics? Olympics are a great sporting event that happens every four years. They have nearly every sport. Chapter 26 The Rise of Democracy. The Rise of Democracy Athens. City-states An early city that was like a small independent country with its own laws, army, and government. Even though the Greeks knew that had many. Forms of Government in Greek City-States 2000 B.C. to 400 B.C. Ancient Greek facts  All competitors at the Ancient Olympics were naked, except perhaps a coating of oil.  One mother was so keen to see her son compete. 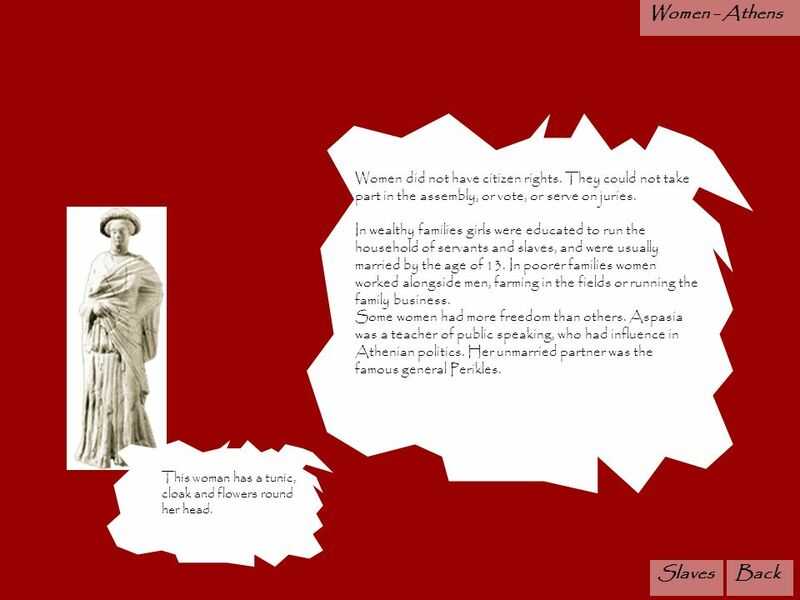 The Legacy of Ancient Greece How did Ancient Athens use Democracy? Decide whether you think the scenario is fair or unfair (circle one).